Since Apple Inc. has released iOS 11, users are enjoying various kinds of experiences with their operating system and the phones. However, in case of any update, your phone might encounter a lot of issues. For example, it can get stuck in the recovery mode, it can freeze and not respond to any of the commands, touch screen might be crashing etc. The article will put an end to the questions regarding How to Fix Frozen iPhone after iOS 11 Update. The latest release has a lot of bugs and the iPhone models encountering them are going through serious troubles. Just after the update, iPhones are behaving abnormally and the reasons are manifold. Most of you must be wondering How to Fix Frozen iPhone after iOS 11 Update but none of you are sure what exactly you can do to sort the issue. Without a doubt, iPhones are excellent devices known for their performance and durability. However, such update-related issues can be troublesome and users often want to know How to Fix Frozen iPhone after iOS 11 Update. Your device is having low internal memory and is unable to accommodate the new iOS 11 update. Moreover, if your phone comprises any corrupted files or applications that are incompatible with the iOS 11 update, then it also ends up freezing your phone. Sometimes, an overheated battery can also be the hindrance in conducting a proper update process. Have a look at the ways you can solve the iPhone freezing issue. If your iPhone is freezing after an iOS update, the first way to fix it is by going for restarting your device. To accomplish this process, press and hold the power button for some time until you see the Apple logo on the screen. After that, release both the buttons. This action varies for different models of iPhone. Such as for iPhone 7 and 7 Plus, you must press and hold the sleep button and volume down button for restarting your device. 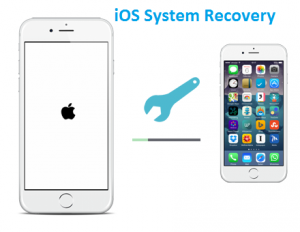 First, download and run the iOS system recovery on your computer. After you are done running the software, connect your iPhone to the computer. A box will be appearing and you need to select the option ‘More tools’ and iOS system recovery. The process will start after the software recognizes your device. Select the model of your iPhone from the given list. After this, the software will inspect all the malfunctions of the iPhone such as frozen Apple logo screen, frozen black screen, frozen in the DFU mode etc. After it is done inspecting the issues, you have to select the Start button to begin the program. In this step, you must confirm all the information about your iPhone. Then, select the option ‘Repair’ if all the information is correctly put. If it is not correct, then select the information given in the manual before you start repairing. Interestingly, to fix the issues of iOS 11 keeps crashing or update, the system recovery will download the new version of the device firmware. This is done after detecting the present iOS. These steps should ideally fix the iPhone keeps freezing iOS 11 issue, and the software will start repairing your iPhone. We understand that settling iPhone issues are not easy and that is why expert guidance is necessary. Here are some of the few easy steps which are devised by our team of experts. Glance on them as you proceed with fixing iOS 11 bugs list. 4- Download the Older iOS Version: If your phone is not responding to the new version, maybe it is unable to take the new upgrade. If possible, try to get the older version by downgrading your iOS. 5- Reset all the settings on iPhone: There can be some issues with your phone’s setting just after you have completed the update process. You may encounter problems like iOS 11 screen not responding, touch not working, the system became sluggish etc. To fix these, open Settings, then go to General. After that, you can select Reset All Settings. With this method, you will not face any data or contacts loss, but it is going to reset your Touch ID, screen brightness and any other customization that you did earlier. Have you tried all the above-mentioned methods? 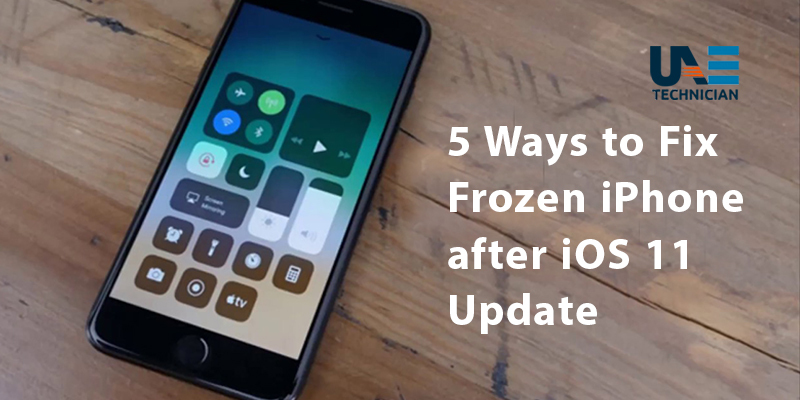 Still confused about How to Fix Frozen iPhone after iOS 11 Update? Do not worry; you can ask our experts to help you out with the issue. They have been working with iPhone issues for years now. The are skilled and professional and can solve any issue that you face with iPhone software or hardware. UAE Technician is clearly the one-stop affordable iPhone repair center for you. You can call us at our helpline number 042053349 In case you find the phone lines congested, then you can chat with the experts via Live Chat facility. Alternatively, you can also send an email describing the issues. The experts are available 24×7 to respond to your queries. Feel free to communicate with UAE Technician at any hour of the day.